He periodically teaches urban planning courses to planning officials and professionals throughout the state of Alabama as part of the University	of North Alabama's continuing education program. His book on downtown planning is required reading for several collegiate planning courses, including those at the University of Massachusetts and Arizona State University. In 2018, Phil Walker was appointed by the Planning Accreditation Board (PAB) as a Site Visitor to help evaluate collegiate planning programs across the country. 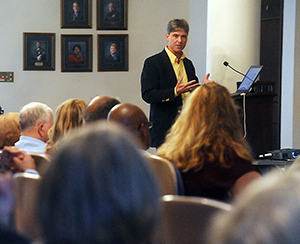 - Smart Growth Planning, Small Towns, the Livable Community: Is Your Plan Helping or Hurting? "I enjoyed your session. Your presentation was streamlined so it was easy to follow and grasp concepts, entertaining with your natural injection of humor, and you had excellent presence. You really connected with your audience."